Bethesda has lost the latest in a long line of legal proceedings against Fallout MMO developer Interplay. Earlier this year, Bethesda filed a preliminary injunction against Interplay to try and stop the company from using any of Fallout's recognizable settings or characters in its Fallout MMO, claiming that doing so would infringe on canon elements of future Fallout games. Though the injunction was quickly denied, Bethesda, undeterred, filed for an appeal against the denial of its injuction. Now, in the latest development of this three year old legal battle, that appeal has been rejected. Here's the story so far: In 2007, while working on Fallout 3 as a licensee, Bethesda Softworks purchased the Fallout IP from Interplay Entertainment but left it the right to create an MMO based on Fallout. Then, in September 2009, Bethesda attempted to sue Interplay for failing to meet contractual funding requirements in the development of said MMO. Since then, both sides have been locked in a drawn-out legal battle. This latest injunction is seperate from the original case, for which litigation is still ongoing. 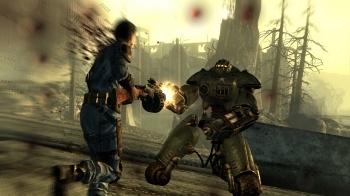 The latest chapter in this story took place this week, when it was shown by documents submitted to the United States Court of Appeal that Bethesda wanted to demonstrate that "the district court abused its discretion and misapplied the law in concluding that Bethesda failed to establish a likelihood of irreparable harm [in its injunction request]." The papers also show that the court remains unconvinced of Bethesda's claims of "irreparable harm." This hasn't been the best month for Bethesda's legal team; it lost its injunction against Minecraft developer Mojang barely two weeks ago. Sadly, this fight is far from over. Since Bethesda owns the IP, Interplay will require its express permission before it can publish any Fallout MMO regardless of how these interminable appeals turn out. Concerns also remain regarding Interplay's finances. We'll keep an eye out for any updates, but something tells me this issue won't be resolved soon.